There are plenty of great apps and toys for kids out there, but rarely are the two combined to create something unique. Fuzzy House is one of those rare treats: taking inspiration from classic toys, it's an interactive playset with handcrafted graphics and characters. In Fuzzy House, there are 6 interactive locations to explore: the entryway, living room, kitchen, upstairs hallway, bedroom, and bathroom. Each location is filled with various interactive objects that can be moved or played with. Additionally, there are 4 knitted characters who inhabit the Fuzzy House: Chip the beaver, Hopsy the rabbit, Siena the alpaca, and Wooly the lamb. At each location, kids can add or swap out characters as they see fit. They can also give each character items to hold or interact with. If the character is given a letter or a book, for example, he or she will read it. They can also plop the character down on a chair, put them to bed, give them a bath in the tub, or dress them up in pajamas. While exploring, kids may notice that a plus button can appear on some items. Tapping on the button allows them to access additional features for that item. For example, kids can tap the frame on the living room wall to change the displayed picture, or on the window to change the weather outside. It is also possible to customize the wallpaper and carpet for every room in the house, by tapping on the paint bucket on the top left. 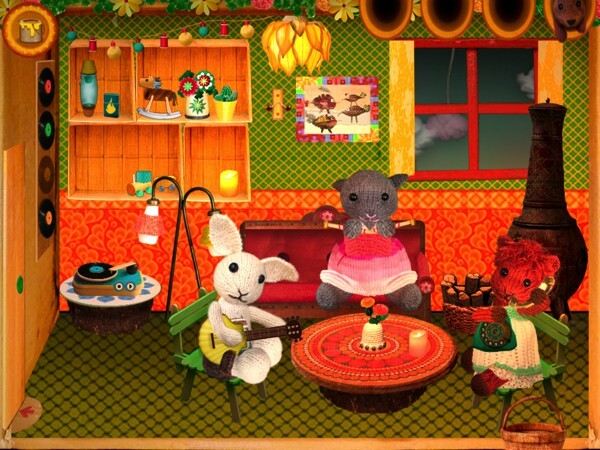 Just like a real dollhouse, the gameplay in Fuzzy House is very much self-directed. There isn't a wrong way to play the app, and kids may use any character or object to role-play and create their very own stories. There is no time limit either, so kids can explore and play to their hearts' content. What's also nice about the app is that it's not geared towards a specific gender, so girls and boys can equally enjoy the app. It also appeals towards a wide range of ages, but especially ages 4 and up. If you are interested to extend your child's playtime beyond the screen, the Fuzzy House website has DIY tutorials for making the toys and items seen in the app. You also purchase knitting patterns to make your own fuzzy friends. Fuzzy House is child-safe. It has no in-app purchases or third-party adverts, and doesn't require an Internet connection. Fuzzy House is technically a modern invention, but it has the charm of a traditional toy. I like how tactile the interface feels, and how easy it is to navigate your way through the app. Even though there aren't any text or audio instructions, kids shouldn't find it difficult to discover even the most hidden features. Visually, the app looks fantastic. The vintage-inspired, handcrafted elements are really beautiful and the use of bright colors really brings the house together. I love the little details that were put into the app, such as the letters in the mailbox and the toys in the bedroom. Out of all the room in the house, the living room is my favorite. There are many interactive trinkets there, from the turntable that actually plays music (you can change the record!) to the rotary phone that allows you to dial friends from around the world. Plus, the room looks so cozy when the fireplace is lit. Fuzzy House combines the practicality and interactivity of a mobile app with the charm and familiarity of a traditional toy, to create a playful dollhouse for a wide range of ages. The open-ended gameplay allows kids to take control of their playtime, and encourages creative exploration. All in all, it's a beautiful app that I highly recommend.